It has been a good day for visualization. http://www.visual-literacy.org/periodic_table/periodic_table.html has to be the best summary of graphic methods for representing data, information and concepts I’ve ever seen. Probably the best there’s ever been in one web page. Now all we need is to get a Topicscape in there. 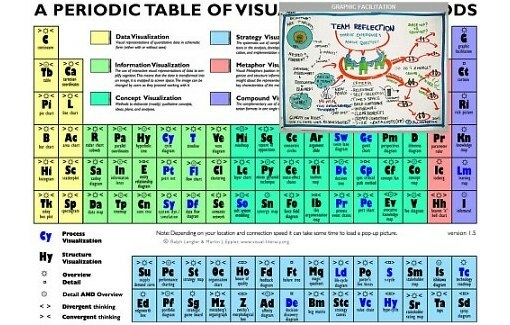 Trouble is Topicscape would span across the Information Visualization, Concept Visualization, and Strategy Visualization areas on this ‘Periodic Table’ of graphical elements. The new version (now coming to the end of its Beta period) of Topicscape allows you to save a page like that as an MHT file and have it running totally off line with all scripts working. (IE can save it but has to get a lot of the data on-line).